Yes please. Sign me up again, this had some KICK to it. I love spice so the more the merrier. This was great, something new. Thick with great textures. I did a few things differently and worked out fantastic, I cooked my chicken first in my slow cooker for 4 hours on low. Then shredded it and added as directed. I also love using my seasoned cast iron skillet, always adds additional flavors. Combine oil and garlic in a large (3-to-4-quart) saucepan. Cook over medium heat, stirring occasionally, until fragrant and sizzling, 1 to 2 minutes. 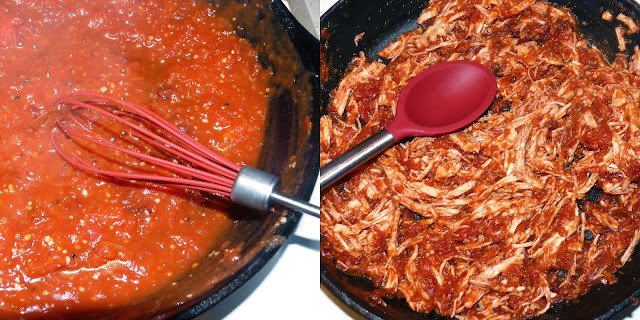 Add tomatoes with their puree (breaking tomatoes up), chipotles and adobo, and 1 cup water. Bring to a boil; season with salt. Reduce heat and simmer rapidly until lightly thickened, 6 to 8 minutes. Add chicken and cook, stirring, until hot, about 1 minute. Remove from heat; stir in chopped cilantro. Divide chips among four shallow bowls; top with chicken mixture and sauce. Garnish with cilantro sprigs, sour cream, and feta. Serve. This dish so yummy! Thanks for sharing. This looks great, I'll have to give it a try.